where you can get information about the city. Qualified staff will give you all the tourist information in English, French and Spanish about monuments, itineraries, events, entertainment, transport and any indication on how to better enjoy the city. STOP at C.I.T. (Tourist Information Center), operators will assist you with competence and courtesy in the tour of the city. 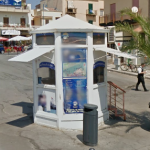 Tourist Information Centers are located in strategic points of the city from the old town to the seaside villages. Here visitors can get information and find all the paper material about Palermo and his lifestyle, as brochures, booklets , maps.